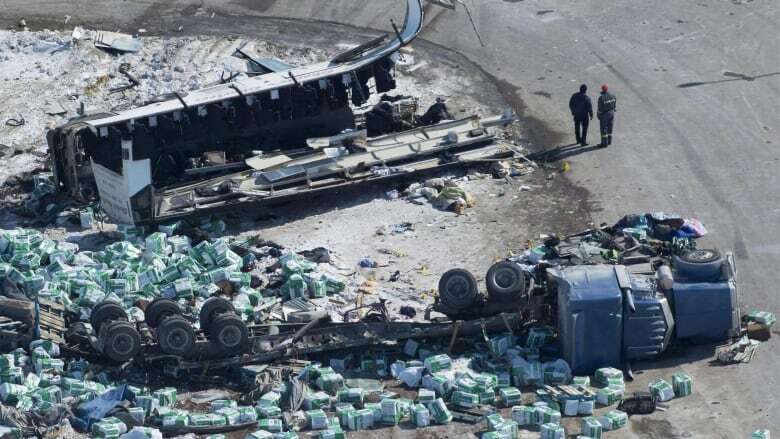 The owner of the Calgary-based trucking company involved in the fatal Humboldt Broncos bus crash has been charged. Alberta Transportation Minister Brian Mason says Sukhmander Singh, owner and director of Adesh Deol Trucking Ltd., faces eight counts of failing to comply with various safety and log-keeping regulations. "The charges follow an investigation that was completed by Alberta Transportation into the collision," Mason said Wednesday. "The investigation found multiple instances of non-compliance of various transportation regulatory requirements in a six-month period." Sixteen people were killed and 13 were injured when an Adesh-owned semi-trailer and the Broncos hockey bus collided in Saskatchewan last April. The semi's driver, Jaskirat Singh Sidhu, was previously charged with multiple counts of both dangerous operation of a motor vehicle causing death and dangerous operation of motor vehicle causing bodily injury. When reached in Calgary, Singh said he didn't have any comment on the charges. The case will be handled by a federal Crown prosecutor because it involves both federal and provincial regulations, according to an Alberta Transportation spokesperson. Eight charges have been laid against the trucking company owner. They include seven federal charges: two counts of failing to maintain logs for drivers' hours of service, three counts of failing to monitor the compliance of a driver under safety regulations, and two counts of having more than one daily log for any day. The eighth charge, under provincial regulations, alleges failure to have or follow a written safety program. Singh's first court appearance is scheduled for Nov. 9 in Calgary. The maximum penalty for a federal hours of service failing is $5,000 per offence, while the provincial charge carries a $310 penalty. A court can, however, use discretion to impose a penalty up to $2,000. Alberta Transportation said Adesh Deol Trucking has been under suspension since the crash. Myles Shumlanski, whose son Nick was injured in the crash, was pleased to hear about the charges. "It's a good start," he said. Governments across the country need to look at why licences are being handed out so easily, Shumlanski said. "Some of the people who did the charging need to look at that, too, because why did it get to that point? It's still happening." Citing the Broncos crash as the reason, Mason said Alberta is making driver training for new commercial truckers and bus drivers mandatory. "The incident prompted jurisdictions across Canada to take a closer look at their safety practices," he said. "Alberta Transportation was already in the process of considering several improvements to traffic safety in our province." The province said the training, which will include a standardized curriculum, will be mandatory as of March 1. "New requirements for trucking companies based in Alberta will enhance safety on the roads right across the continent," Mason said. The province will eliminate a temporary safety fitness certificate and require all new commercial carriers to prove compliance with transportation safety regulations before they start operating, he said. They will also be required to renew it every three years. Earlier this month, Alberta also announced it will ditch its privatized model for road testing and will administer road exams directly to new drivers. Officials said testers will be government employees, and there will be more oversight to ensure road exams are conducted fairly and consistently.